7201. Frieda Lusil Kraft, “Tauf-Schein,” November 6, 1921, Lincoln, NE. Frieda Lusil, kind von Alex. Kraft und dessen Ehefrau Magdalena, Geboren zu Lincoln, Neb. am 30th Aug. 1921. Wurde getauft in den Namen des Vaters und des Sohnes und des Heiligen Geistes am 6th Nov. in Jahre des Herrn 1921. 7204. 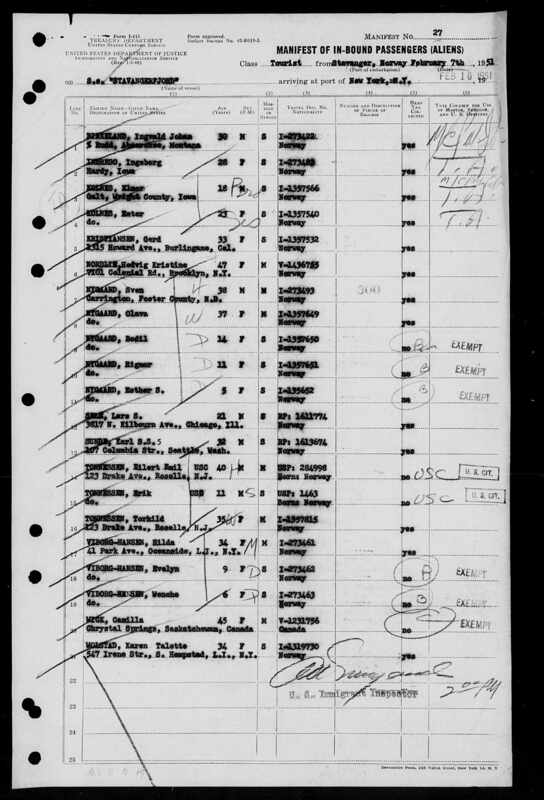 Sven Nygaard, “Ellis Island and Other New York Passenger Lists, 1820-1957,” February 16, 1951, Ellis Island, New York City, New York County, NY. Ship name S.S. Stavangerfjord departed Stavanger, Norway on February 7 and arrived in New York, NY on February 16, 1951. 7205. “Olava Nygaard,” Find-A-Grave, https://www.findagrave.com/memorial/135872087, 135872087. 7206. “Sven Nygaard,” Find-A-Grave, https://www.findagrave.com/memorial/135872007, 135872007. 7209. Hans R Midbrod, “Ellis Island and Other New York Passenger Lists, 1820-1957,” March 7, 1927, Ellis Island, New York City, New York County, NY. Ship name S.S. Stavangerfjord departed Stavanger, Norway on February 26 and arrived in New York, NY on March 7, 1927. 7210. “Andrew Woll,” Find-A-Grave, https://www.findagrave.com/memorial/43776797, 43776797. 7211. “Norma E Broderson Woll,” Find-A-Grave, https://www.findagrave.com/memorial/43776818, 43776818. 7212. “Ralph Edward Woll,” Find-A-Grave, https://www.findagrave.com/memorial/15619141, 15619141. 7220. 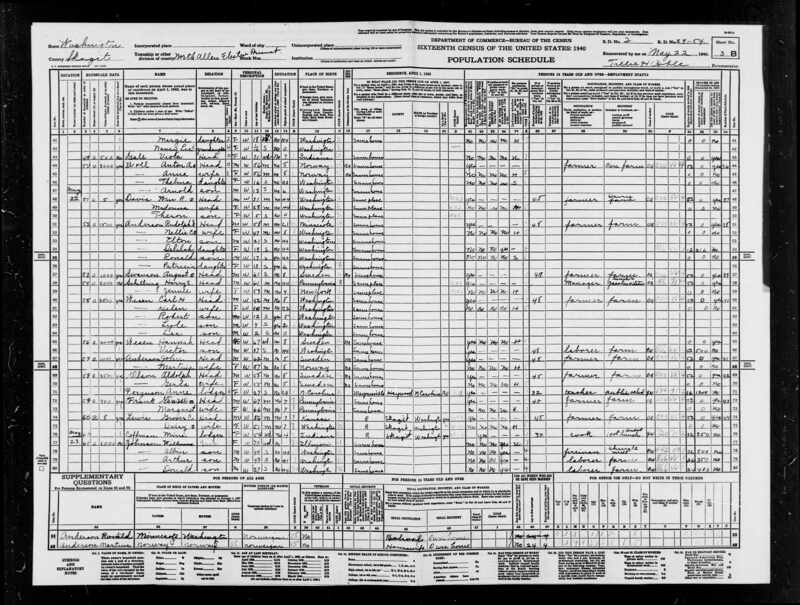 Andreas Reinertsen Midbrod aka Andrew Wall, “Washington, Western District, Naturalization Records, 1853-1957,” November 20, 1930, Seattle, King County, WA, https://www.familysearch.org/ark:/61903/1:1:QGP2-1SV7. 7221. 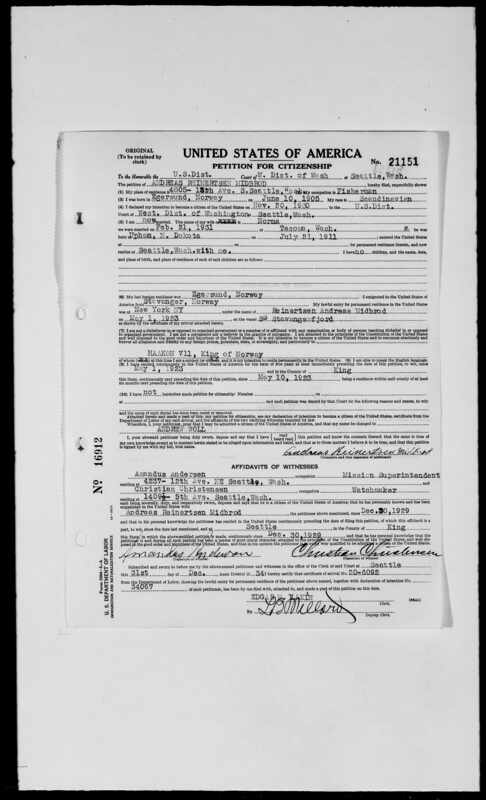 Andreas Reinertsen Midbrod aka Andrew Woll, “Washington, Western District, Naturalization Records, 1853-1957,” December 31, 1934, Seattle, King County, WA, https://www.familysearch.org/ark:/61903/1:1:QGP2-1SJ9. 7222. “Chris Woll,” Find-A-Grave, https://www.findagrave.com/memorial/35488799, 35488799. 7224. “Anton A Woll,” Find-A-Grave, https://www.findagrave.com/memorial/20514629, 20514629. 7225. “Anna Woll,” Find-A-Grave, https://www.findagrave.com/memorial/20514703, 20514703. 7226. “United States Census,” 1940, WA, Skagit, North Allen Election Precinct, 3B, 2, 29-54, T627, 5460349, 768, Bureau of the Census, US Dept. of Commerce, United States of America, May 21, 1940, Tillie H Coble. 7227. 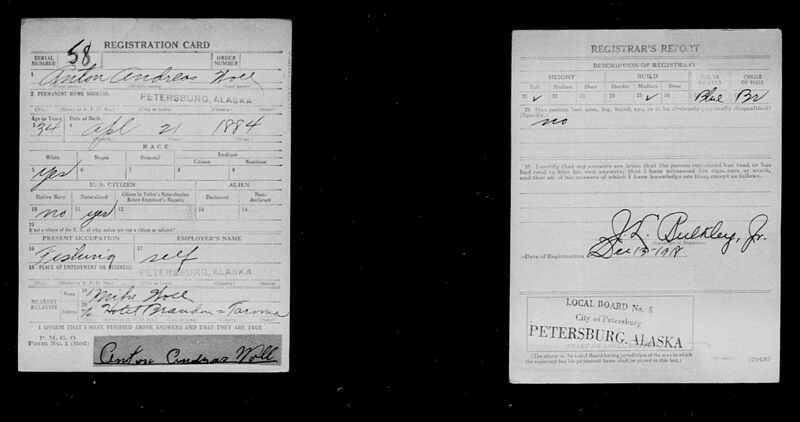 Woll, Anton Andreas, World War I, 1918, AK, 58, “United States World War I Draft Registration Cards, 1917-1918,” September 13, 1918, Petersburg, AK, https://www.familysearch.org/ark:/61903/1:1:KZVQ-PXT. 7228. 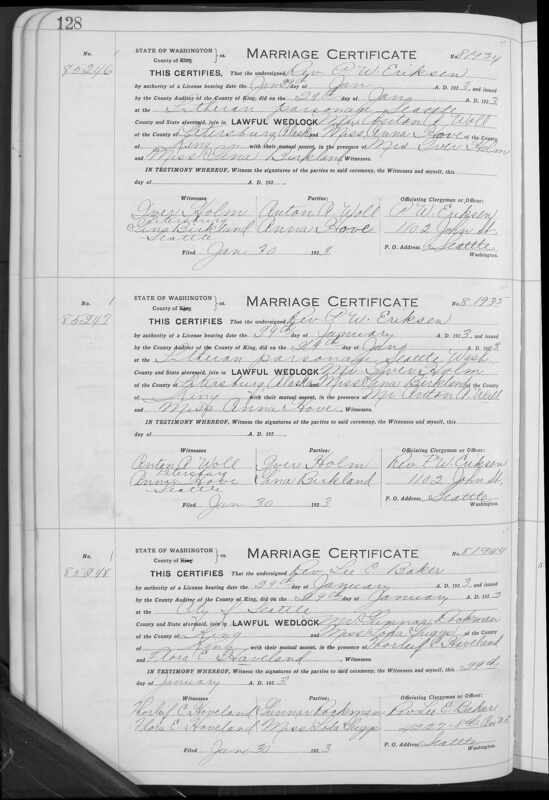 Anton A Woll and Anna Hove, “Washington, County Marriages, 1855-2008,” January 29, 1923, King County, WA, https://www.familysearch.org/ark:/61903/1:1:QKNY-1BN7. In an interesting interplay, they had a double marriage and each couple signed as the witnesses for the other. 7229. Monty Bryan Jones and Thelma Woll, Herald and News, Klamath Falls, OR, February 21, 1953, 6. Mr. and Mrs. Monty Bryan Jones . . . who were married in Bellingham, Wash., late in December, in Our Saviour’s Lutheran Church. The bride is the former Thelma Woll, daughter of Mr. and Mrs. Anton A. Woll, Bow; and the bridegroom is the son of Mr. and Mrs. Monty B. Jones, 821 Mt. Whitney. The couple is at home in LaConner, where Jones, a graduate of WWCE class of ’47, is teaching. The new Mrs. Jones is a graduate of St. Luke’s Hospital School of Nursing, the New York Hospital and the Cornell Medical School of Anesthesia. She is now doing anesthesia in St. Luke’s, Bellingham. 7230. “Monty B Jones,” Find-A-Grave, https://www.findagrave.com/memorial/87271272, 87271272. 7231. “Thelma W Jones,” Find-A-Grave, https://www.findagrave.com/memorial/87271276, 87271276. 7232. Arnold Woll and Edith Knoppi, “Washington Divorce Index, 1969-2014,” April 17, 1989, https://www.familysearch.org/ark:/61903/1:1:QLC4-HLQF. Three children under the age of 18 at time of divorce. 7233. 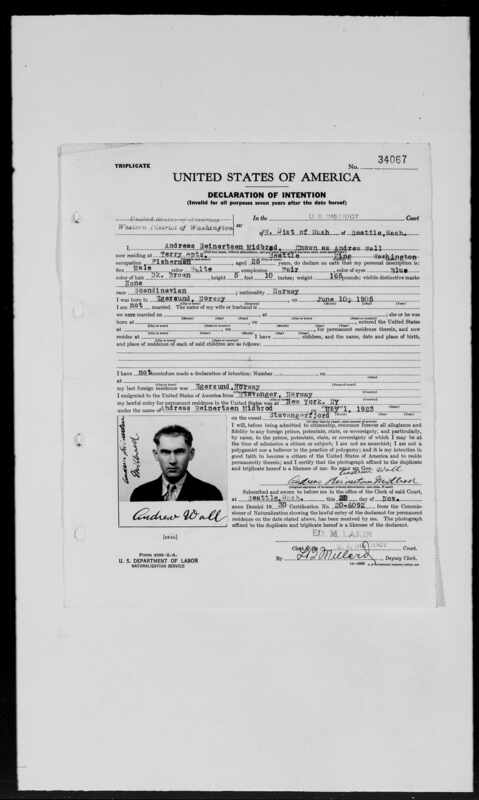 Curtis Arnold Woll, “Washington Death Certificates, 1907-1960,” June 11, 1959, Burlington, Skagit County, WA, https://www.familysearch.org/ark:/61903/1:1:N31L-GYH. Two days old at time of death. 7234. “Curtis A Woll,” Find-A-Grave, https://www.findagrave.com/memorial/20514401, 20514401. 7235. “Edith Ann Knoppi Woll,” Find-A-Grave, https://www.findagrave.com/memorial/122134777, 122134777. 7236. “Obituaries,” Edith Ann Woll, Skagit Valley Herald, Burlington, WA. Edith Ann Woll, 83, longtime resident of the Skagit Valley, unexpectedly passed Thursday, December 19, 2013. She was born September 12, 1930 to Lauri and Anna (Nordstrom) Knoppi, at Rowley's Maternity Hospital in Mount Vernon, WA. She graduated from Sedro-Woolley High School class of 1949. She went to work for Sears in Mount Vernon for almost 5 years. On January 2, 1954 she married Arnold Woll of Bow. They continued farming in Bow. She became a homemaker and they started their family. She was a wonderful mom and a great cook. She liked to get with other farm wives at each others homes for coffee. She was a member of Edison Lutheran Church until moving away. She liked league bowling in the 60's and 70's. She also loved to go dancing, clear up until later years. She was a member of the Kirkland Eagles. She was preceded in death by her folks and an infant son, Curtis. Also preceded by brother John Knoppi, sisters and brothers-in-law Gaye and Percy Buchanan, I'Lee and Dave Whitney, and brother-in-law, Jerry Tolbert (Karen). Also daughter-in-law, Valary. She is survived by her children, son, Roland and Katie, his children, Beth, and Nick and his wife Heather. Her daughter Lauri and husband Wade Rusmusson, their daughter Audrea and her daughters Alexia and Nielly. Her son Roger. Her sister Karen and her husband Walt Rittereiser. Also ex-husband Arnold. Also sister-in-law Alma Pollard and numerous cousins, nieces and nephews. A memorial service will be held Friday, December 27, 2013 at 1:00 p.m. at Hulbush Funeral Home, Burlington. Interment will follow at Fir-Conway Lutheran Cemetery at Milltown. Memorials may be sent to Virginia Mason Foundation, Bailey-Boushay House, P.O. Box 1930 M. S. D1-MF, Seattle, WA 98111-9866. 7237. 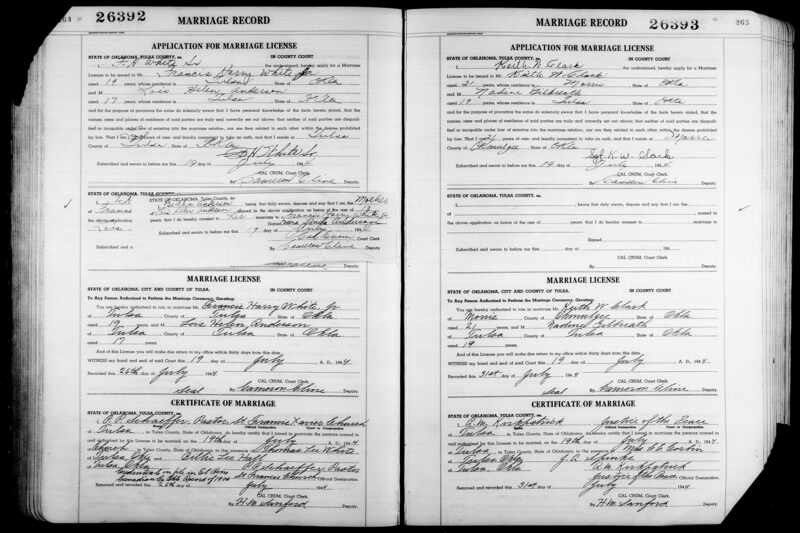 Roland M Woll and Valary R Bokker, “Washington Marriage Index, 1969-2014,” June 2, 1973, Skagit, WA, https://www.familysearch.org/ark:/61903/1:1:QLH2-ZB69. 7238. Valary R Woll, “Washington Death Index, 1965-2014,” February 22, 2004, Skagit, WA, https://www.familysearch.org/ark:/61903/1:1:QLWS-B8BR. 7240. “Obituary,” Billie White, http://www.moorefuneral.com/obituaries/Billie-White-22792/#!/Obituary. Billie Lee White, 85, passed away Thursday, June 13, 2013 in Tulsa, OK. Born November 25, 1927 to William Herbert and Twila Lee (Woodard) Hall. Survived by five children, Larry Douglas White of Tulsa, OK, Carolyn “Jeannie” Estep and husband, Raymond H., Sr. of Broken Arrow, OK, Kenneth Lee White and wife, Valerie of Houston, TX, Ronald Paul White of Tulsa, OK, and Thomas Daniel “Danny” White of Tulsa, OK; grandchildren, Raymond H. Estep, Jr. and wife, Marisa of Broken Arrow, OK, Bryan James Estep and wife, Amanda, also of Broken Arrow, OK, David Michael White and wife, Amanda of Houston, TX, Alex White of Ft. Worth, TX, Dalton White and Kimberly White, both of Tulsa, OK; great-grandchildren, Connor James Estep and Madison White; sister, Bonnie Lou Cole and husband, Edward of Broken Arrow, OK. Preceded in death by husband, Thomas Lee White; brother, Joe Rex Hall. Service will be 1:00 P.M., Tuesday, June 18, 2013 at Moore’s Southlawn Chapel. In lieu of flowers, friends may contribute to the Susan B. Komen Fund or St. Jude?s Children Hospital. To send flowers or a memorial gift to the family of Billie White please visit our Sympathy Store. 7241. Francis Harry White Jr. and Lois Helen Anderson, “Oklahoma, County Marriages, 1890-1995,” July 19, 1944, Tulsa, Tulsa County, OK, https://www.familysearch.org/ark:/61903/1:1:QVPX-W7Q6. 7242. “Lois H White,” Find-A-Grave, https://www.findagrave.com/memorial/182358694, 182358694. 7246. “Merlin Jack Eberhardt,” Find-A-Grave, https://www.findagrave.com/memorial/189289901, 189289901.